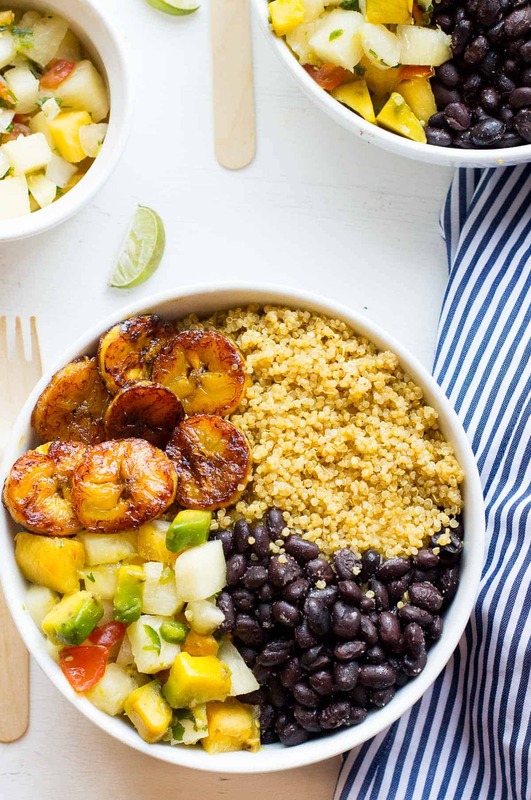 These Cuban Quinoa Bowls are loaded with seasoned black beans, juicy plantains and an addictive sweet and spicy pineapple salsa! So here’s a bold statement: I’m pretty sure I was doing bowl foods before everyone else was; everyone else being the internet. I know…what?! Yet I’m sure that many of us woke up one day, saw that bowl foods were a thing and thought, that’s how I’ve ALWAYS been eating!! Food in bowls seem to just taste better; all the flavours are mixed, you get a wide range of textures and you can arrange food beautifully – win, win and win. 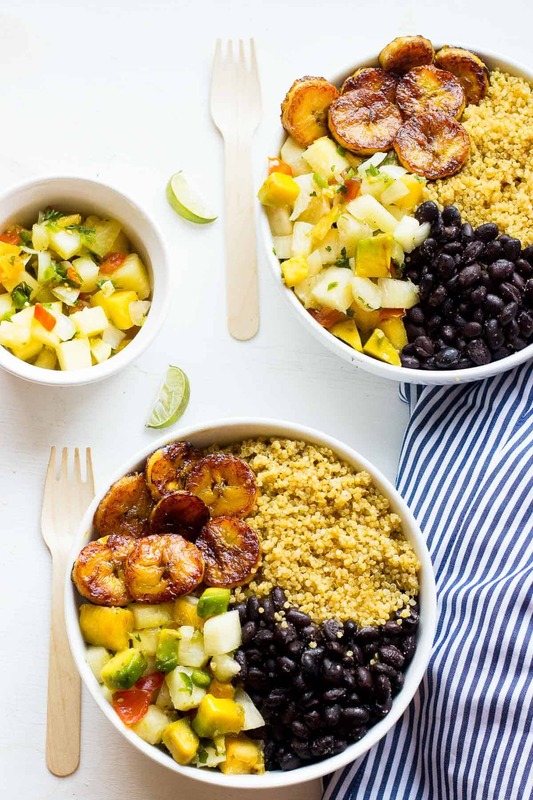 These Cuban Quinoa Bowls with Pineapple Salsa are no exception; so much to the point that I have made them about five different times in month, which is major for me. My absolute favourite part? Those INSANE plantains. 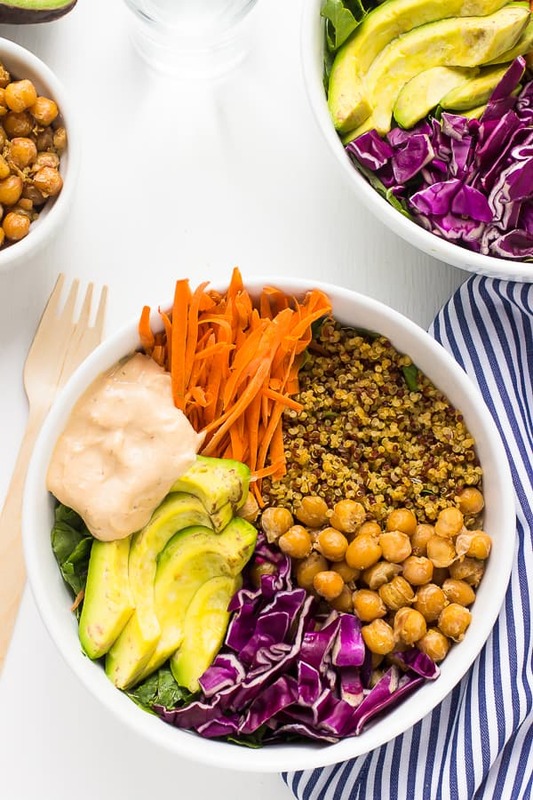 These Cuban Quinoa Bowls are a play on Cuban Rice Bowls, except with quinoa of course, which I am officially obsessed with (it is always in our fridge). Putting together this bowls was also really easy since 1) I actually always have all of these ingredients in my house, all the time, 2) because none of them take a lot of time to prepare separately and 3) I eat plantains with everyone and anything as much as possible, so I was EXTRA excited to putting this bowl together. Simply put, this is one of the best bowl foods I’ve ever had. 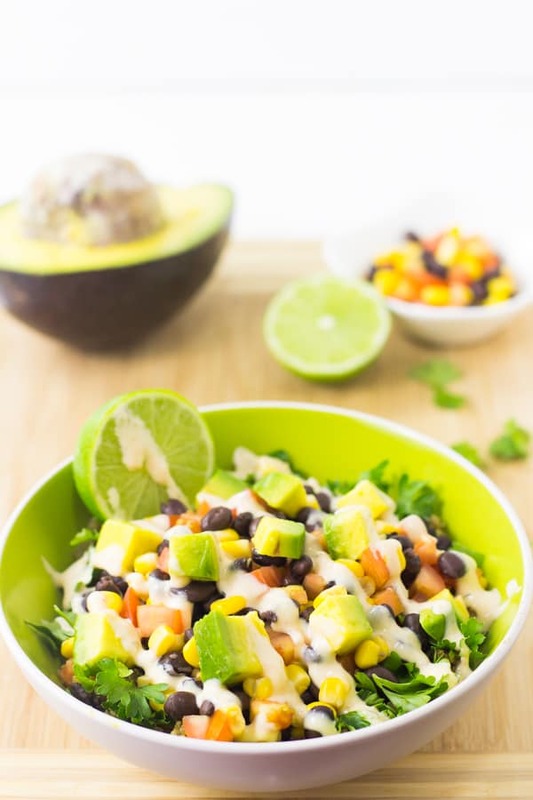 The combination of well seasoned black beans, delicious fluffy quinoa, avocado sweet and spicy pineapple salsa and fried plantains works so incredibly well. Let’s talk about this pineapple salsa for a bit. Make sure you get a sweet pineapple and pair it with raw jalapeños if you can. You get the best combination of flavours this way and the best delicious contrast of sweet and spicy. This salsa actually goes with pretty much every bowl food one earth so be prepared to see it featured here again. The plantains? Oh wow. I buy plantains at the farmer’s market every time I go, and the key is making sure your plantain is extremely ripe before pan frying it – so I’m talking black skin. It’s the sweetest at this point and the best texture. I love pan frying mine – just a bit of coconut oil and frying on either side until golden bake, but you could also easily bake these. All in all, this is a complete winner, and already on rotation in my household. Make this, and I guarantee it’ll be one of the best things you’ve done all year. Even better, make this for me and invite me over, m’kay? If you try this Cuban Quinoa Bowl with Pineapple Salsa, please let me know in the comment section below, or tag me on instagram with the hashtag #jessicainthekitchen! For more exclusive recipes follow me on Instagram AND on Snapchat: jessinkitchen. Mix the ingredients for the pineapple salsa together in a bowl. Set aside and allow the flavours to meld together until ready to use. In a pan over medium high heat, heat the coconut oil. Add the plantain slices to the oil and pan fry on each side for about 4 minutes or until golden brown. Remove the heat and season with sea salt. Set aside. 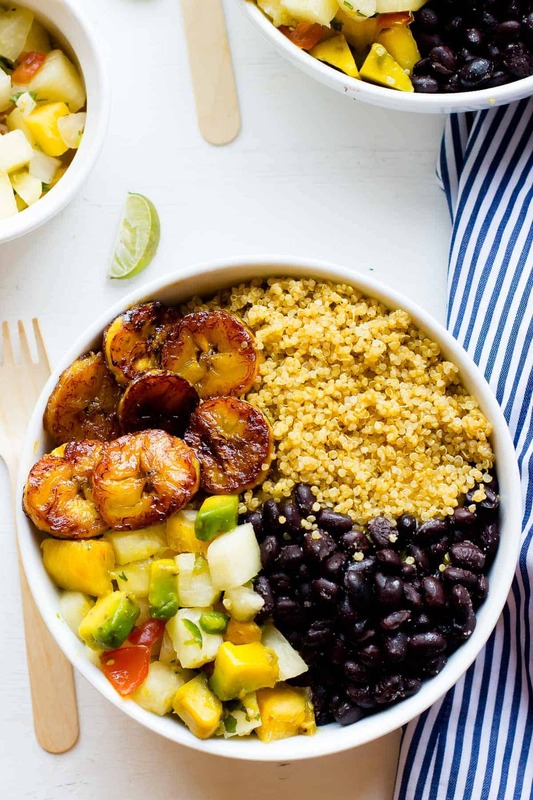 Add ½ cup cooked quinoa, ½ cup seasoned black beans, ½ cup pineapple salsa and ¼ fried plantains slices to each bowl. Feel free to mix and match and increase or decrease any quantities that you want, and enjoy! This recipe is gluten free and vegan. You can make everything at the same time, or at different times and just use the same pan after each portion is cooked. Remember to use a sweet pineapple and a very very ripe plantain. 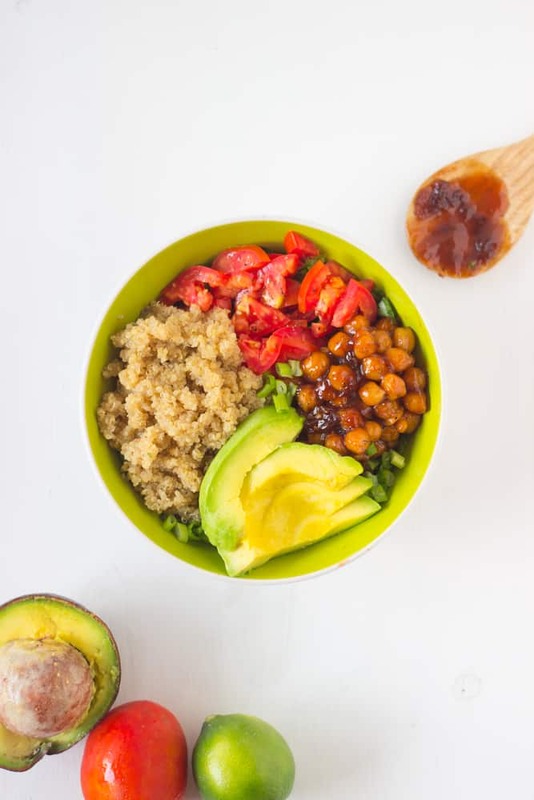 If you want to prepare this bowl ahead of time, I recommend preparing all the ingredients ahead of time for prep in separate tupperware containers, so that you can just reheat them put the entire bowl together. You can make the bowl a day in advance then eat it, but I wouldn’t recommend keeping it together for longer than that. If you’re making this for lunch, just assemble it all together the morning of, or in a mason jar. I haven’t eaten much Cuban food before, but I am loving the sound of this. I ate so many plantains when we were in Jamaica! Thanks Dannii! Also so glad you enjoyed Jamaica! This looks amazing! So much love goes into a good bowl, doesn’t it? : ) I had the chance to try out lots of Cuban food when we were in Miami Beach last year…I discovered so much deliciousness! I love the combination you have here. Each component is special but all together in a bowl is such a treat. So true Monica! Thanks so much!! I love quinoa! Don’t know anything about cuban kitchen, but if everything looks like this, I am sure I would love it! Thanks Angie!! This ingredients worked so well together. That sounds great Hanifa! Thank you for your comment! We’re glad you liked it. Happy Holidays!